The greatest challenges facing humanity over the next decades involve finding renewable sources of energy and finding ways to restore natural resources such as clean water that have been polluted by industrialisation. Dr Justyna Widera-Kalinowska of Adelphi University uses innovative nanohybrid materials to address these problems and is engaged in an international effort to train the next generation of chemists to build a cleaner future. As an ever-growing human population puts its strain on the resources of our planet, it is becoming more and more essential for humanity to turn to innovative solutions that can provide us with clean sources of energy and allow us to engage in environmental remediation to repair the damage pollution has done to our natural resources. Developing sustainable power sources to replace the burning of fossil fuels will be essential to stopping global climate change, and without intervention, many areas of the world will soon face shortages in clean, drinkable water. It is critical that today’s college students in science, technology, engineering, and mathematics (STEM) be prepared to contribute to solutions for these global level problems and that the students entering these fields be as diverse as the populations they serve. It will take international cooperation and collaboration between scientists and policymakers to ensure that our planet is a safe and healthy place for future generations. The United States National Science Foundation International Research Experience for Students (NSF–IRES) program offers funding for educational programs that provide innovative research opportunities to undergraduate students. 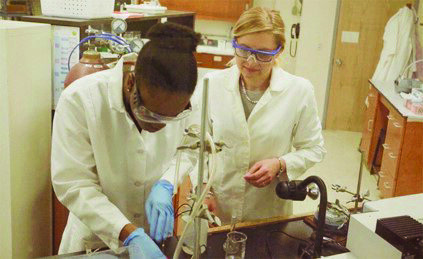 Dr Justyna Widera-Kalinowska, an associate chemistry professor at Adelphi University in Garden City, New York, saw an opportunity to facilitate international scientific collaboration in energy and environmental materials research, while also providing career building opportunities for minority and female students of STEM. Through a partnership with Warsaw University in her native Poland funded by the NSF–IRES, Dr Widera-Kalinowska provides diverse and underprivileged students the opportunity to receive world class training and early career experience in nanomaterial research for environmental remediation with renowned European researchers in Poland over their summer, along with additional support and professional development in the US during the school year. As the world’s population grows exponentially each year and industrialisation spreads further around the globe, the depletion of non-renewable fossil fuels keeps humanity constantly on the edge of a worldwide energy crisis. Further, the burning of fossil fuels pollutes our land, air, and water, and has brought on global climate change that threatens human health, commerce, and societies, along with destroying biodiversity in ecosystems around the world. The limited availability of fossil fuels, coupled with their dangerous side effects of pollution and global climate change, demands the development of clean and sustainable alternate energy sources. Solar energy presents one of the foremost options to meet the demand for clean energy, however advances in the efficiency and power of solar panels, along with the development of low cost manufacturing and installation methods, are necessary before solar energy becomes a viable solution. Developments in photovoltaic nanohybrid materials may offer the advances necessary to make this happen. Nanohybrid materials are made from a combination of different types of substrates, blended together such that some of the structural integrity of each material is maintained at the molecular level and the resulting hybrid performs with characteristics of each of the original materials, sometimes also taking on new properties. A photovoltaic nanohybrid consisting of various nanomaterials produces an electrical current when exposed to light, making them an ideal material for solar panels. Among the other greatest challenges poised to face humanity in the near future is the decreasing availability of clean drinking water. In many developing nations this is already a major issue, with access to clean water often most limited in the most vulnerable populations. While the planet is covered in water, about 97% of it is undrinkable salt water, and another 2% is contained in glaciers and other inaccessible forms. Only about 1% of the earth’s water is drinkable, found mostly as groundwater. 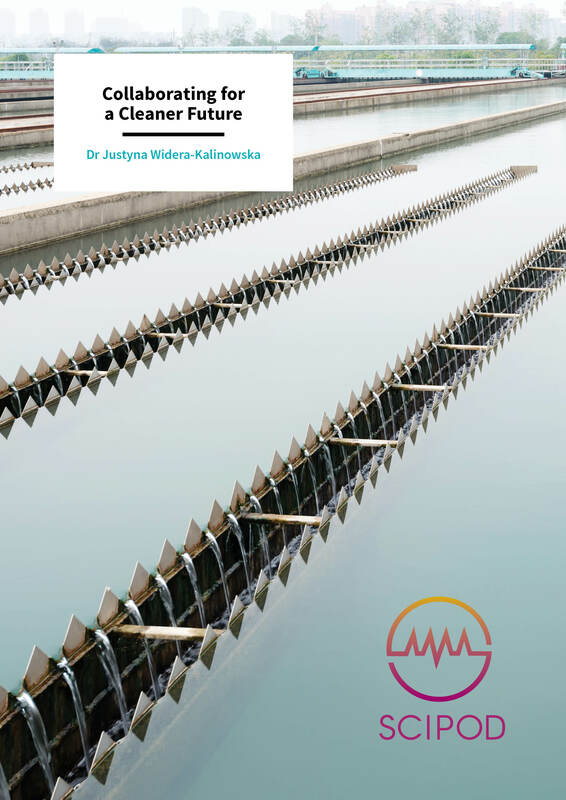 As industrial activities, agriculture, and domestic water usage continue to generate large amounts of dirty wastewater in both developed and developing countries worldwide, reservoirs of clean water shrink by the day. Without intervention, it is anticipated that over the next few decades water scarcity will become a global problem, even in regions of the world that are currently considered water rich. Once again, nanomaterials could offer a ray of hope. Photocatalytic nanomaterials offer a novel way to clean industrial pollutants and waste from water sources. These materials accelerate specific chemical reactions when exposed to a polluted water sample and light, generating the energy necessary to break down organic wastes into harmless carbon dioxide and clean water. These materials could be used in water treatment facilities to not just attempt to filter out, but truly cleanse dangerous pollutants from wastewater and make it safe and drinkable again. Nanohybrid materials offer a great deal of promise for environment saving technologies, and as an expert in these novel tools, Dr Widera-Kalinowska wanted to get more students involved in this fascinating area of research early in their careers and wanted to find a way to connect them with experience of study abroad in her homeland of Poland. She recognised the demand for more researchers with an understanding of these innovative materials and a need to increase diversity and inclusion in the world of nanomaterial science and STEM in general. Working with Professor of Chemistry Magdalena Skompska from Warsaw University, she applied for an NSF–IRES to form a partnership between the universities and support the training of undergraduate STEM students, particularly from minority and underprivileged backgrounds and in 2016 secured funding for the training of twelve undergraduates, four students a summer over three years. The program has a focus on recruiting students that are typically underrepresented in STEM fields, such as women, students of colour and individuals from disadvantaged economic backgrounds. The goal of the program is to get students involved in nanomaterials research for environmental applications early in their careers, with the hope that they will continue fostering international collaboration in developing novel solutions for the challenges that face humanity in the coming decades. Further, the program strengthens STEM education at both Adelphi and Warsaw University and provides a foundation for strong future collaborations between material chemists from the two institutions. The program kicked off in the Fall semester of 2016 at Adelphi University, with an independent study chemistry course that any interested student could join. The course offered weekly one-hour classes, where students could gain exposure to foundational concepts, techniques, and applications of material science and research. From this class, Dr Widera-Kalinowska chose the four most promising students to participate in a second course in the Spring of 2017. 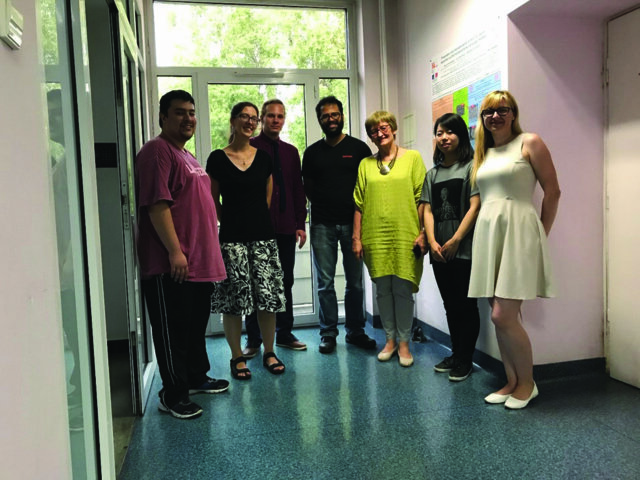 Throughout the second semester, the four NSF–IRES funded students received regular one on one mentorship from Dr Widera-Kalinowska, training in basic electrochemistry and nanotechnology techniques, and cultural preparation for their trip to Poland. An additional student was able to secure funds to participate in the program through a McDonell Summer Fellowship, thus five students who were female and/or minority students, were able to travel to Warsaw for eight weeks in the summer of 2017. Students were able to focus on their area of interest, splitting evenly between photovoltaic and photocatalytic research. While in Warsaw, the students received immersive training in nanohybrid material creation, participated in research in both photovoltaic and photocatalytic materials, and enjoyed cultural activities and excursions around Poland. The initial summer of Widera-Kalinowska’s NSF–IRES program was a great success, producing findings in both photovoltaics and photocatalysis that could inform future technologies in these fields. The students researching photovoltaics for solar energy applications focused on the nanoscale interactions between two promising compounds, polyaniline and cadmium sulphide nanoparticles that produced electrical current when exposed to solar light. They found that the ratio of the components to one another impacted the material’s efficiency in converting solar energy for the devices they built, due to the variations in their bandgaps, or the distance electrons had to travel between conducting surfaces in different configurations of the material. This finding allowed them to predict which compositions of the nanomaterial would be the most effective at harvesting light energy, a critical factor in making solar energy a viable solution for sustainable energy challenges. The students will continue in this vein of research, working to develop more efficient photovoltaic devices that one day could play a role in providing alternative energy sources to the world. The students researching photocatalytic materials for water clean-ups and environmental remediation also made substantial findings. They built novel composites out of varying concentrations of nitrogen doped titanium dioxide, cadmium sulphide, and a conducting polymer (poly-1,8-diaminocarbazole) to obtain nanohybrid materials with varying bandgaps that could effectively degrade organic pollutants while being stable enough for practical applications. Nitrogen doped titanium dioxide and cadmium sulphide are known to be an effective combination of semiconductors for photocatalysis, however, the cadmium sulphide quickly degrades in a standard composite. The students’ addition of a stabilising polymer (poly-1,8-diaminocarbazole) aimed to make the material more enduring. For the photocatalyst testing experiments, they used 4-chlorophenol, a common industrial chemical that is regularly found as an environmental contaminant and has a similar structure to many other common toxicants. This chemical can be harmful to humans if swallowed, and is highly toxic to aquatic life, thus is a prime candidate for removal from freshwater systems in environmental remediation, as well as removal from city water supplies. 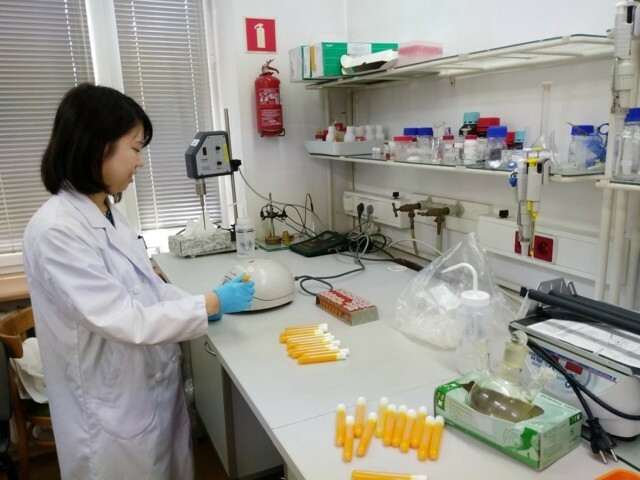 The novel nanohybrid materials the students produced were used to successfully degrade 4-chlorophenol in the presence of light and the addition of the polymer made the material much more stable than previous composites. 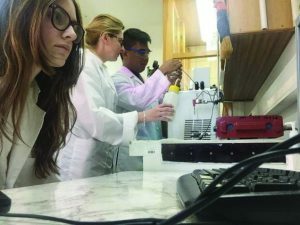 The students’ research team hopes to continue developing this composite material into something that could someday be a practical choice for large scale water purification efforts. Justyna Widera-Kalinowska began her education in Poland, obtaining her MSc in Chemistry from the University of Lodz in 1995 and her PhD in Chemistry from the University of Warsaw in 2000. 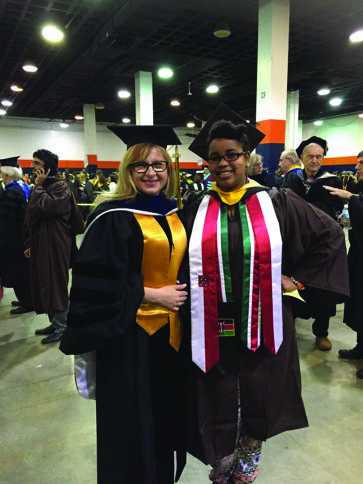 She went on to serve in multiple prestigious post-doctoral and commercial research positions in Germany and the United States, before joining the faculty at Adelphi University in the Department of Chemistry in 2005. She currently serves as an Associate Professor of Chemistry along with holding a position as the Director-at-Large for the New York section of the American Chemical Society. Her research focuses on nanotechnology and conducting polymers for sustainable energy and environmental remediation applications. Dr Widera-Kalinowska is deeply committed to promoting inclusion and diversity in chemistry and STEM as a whole.